Use this simple self-test to find out if your job search is keeping you down more than it should. The Patient Health Questionnaire (PHQ-9 for short) was developed by Pfizer and “is used as a screening and diagnostic tool for mental health disorders of depression, anxiety, alcohol, eating, and somatoform,” according to Wikipedia. In other words, the PHQ-9 is useful enough that doctors will administer it to potential patients, yet simple enough that you can test yourself. While I'm not a doctor and this test shouldn't be considered as medical advice, take it here below to judge whether you should talk to a doctor or otherwise get help for a state of mind that's making your job search harder than it needs to be. 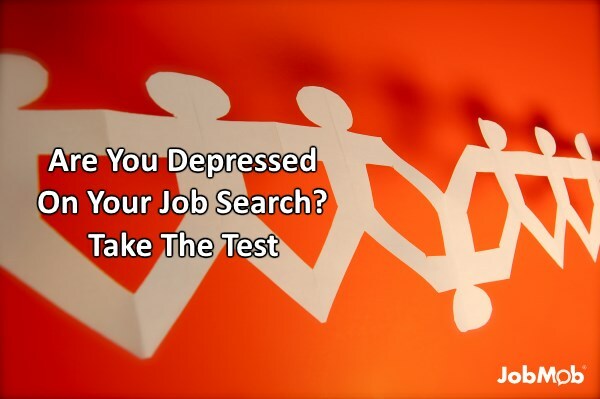 How long have you felt job search depressed? As you do the test, choose the best answer to each question and note the corresponding number of points, which you can add up as you go or at the end. Once you complete the test, now add up all the points from your answers to calculate a final score. If you tally more than 27 points, you've either miscalculated or you recorded multiple answers for at least one question. Before checking your results, please keep in mind again that I'm not a doctor, and that the following conclusions aren't medical advice, they're simplifications of what I've seen from scientific sources. Minimal depression, if any. Nothing to worry about. Mild depression. Re-test yourself in another two weeks. If the situation hasn't improved, talk to a doctor or therapist. You might be moderately depressed. Talk to a doctor. Please see a doctor as soon as possible, you need help and I want you to get it. While you might think to ask your general practitioner or family doctor first, a psychiatrist is best equipped to diagnose people who might be depressed and decide on the correct treatment for what is actually a fairly complex health issue. Job search is hard enough without the burden of depression, and the accompanying lack of self-confidence is hampering you more than you realize. Employers rarely make pity hires, and you don't need to be one. What do you find is most depressing about your current job search? Tell us in the comments. Use a fake name, if you feel the need to go anonymous. Subscribe to JobMob via email and follow me on Twitter for more help job hunting while depressed.